It's no secret that the Tiger Fever has gone almost surreal. I haven't seen anything selling out so fast in boutiques and online like this ever. The design and functionality perhaps are not the selling point. Stylecaster in their November 2012 article "Anatomy of a Fad: How Kenzo's Tiger Sweater Sold Out in Two Days" reported: During the Spring 2013 collections in New York, it seemed like every It-blogger, fashion editor, and model was wearing one, and—making the item all the more tantalizing—the sweaters were not to be found for sale anywhere. It's been six months since the article was posted and the sweaters are still not available for sale anywhere worldwide. I put my name on the waiting list in Kenzo Singapore Takashimaya boutique months ago and still there were no response. I decided I couldn't wait longer and passively waiting won't make me get one. So I began searching for it online. There wasn't anything available (sweater/sweatshirts in any version) at any online boutiques even when I typed in "Kenzo tiger sweatshirt buy" on Google page 15-20. I was even more desperate I almost bought one from eBay and local resellers for at least twice as much the actual retail price. 1. Bookmark reputable online shopping websites (eg. Matches, Net-a-Porter, Nordstrom, MyTheresa and Farfetch) that stocks them, and add the particular item to your wishlist. You will be notified once your size is available. Wait for at least 3-7 days. 2. Write an email to European boutiques listed on Farfetch because they are reputable and you can be sure you're getting a genuine sweater. I wrote to diego@elitespain.es from Elite Boutique in Marbella, Málaga and he is very helpful. He can make your order processed directly by the store and their boutique will not upload the stock to Farfetch. 3. Be a member of the PurseForum (tPF), which is the source of anything luxury fashion, from reference library to shopping intels. Check this thread on tPF (dedicated to Kenzo Tiger sweater) daily, if you can, in the morning and at night. The ladies are extremely helpful. If not from this thread I don't think I would be able to get one at actual retail price (€ 214,00) from Bagheera Boutique. Last but not least, good luck in finding one or two, in your desired color and material combination! i need to get this sweater ASAP! 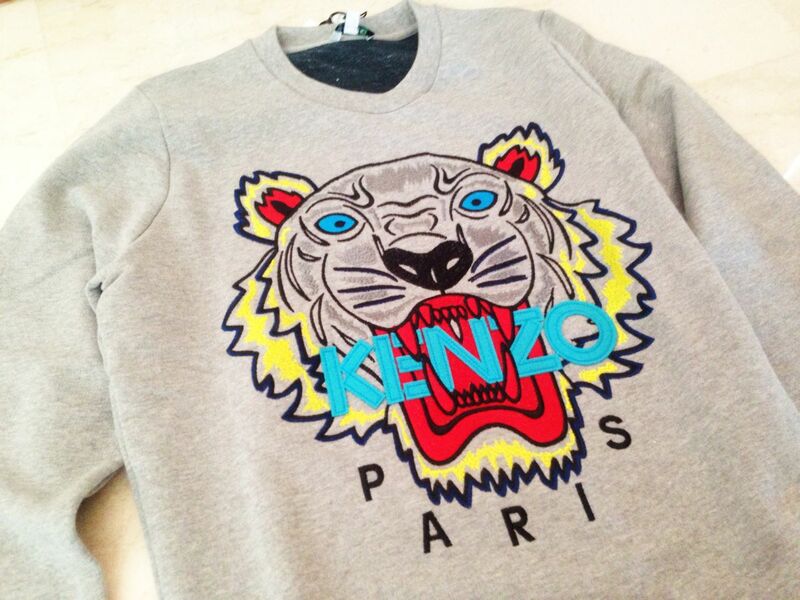 Hi, I have juz got my Kenzo Tiger Sweatshirt, the Spring/Summer 2014 collection. The size is too big for me "M" - White color. I am letting it go, anyone interested? Just to add on. Its brand new, with price tag still on.